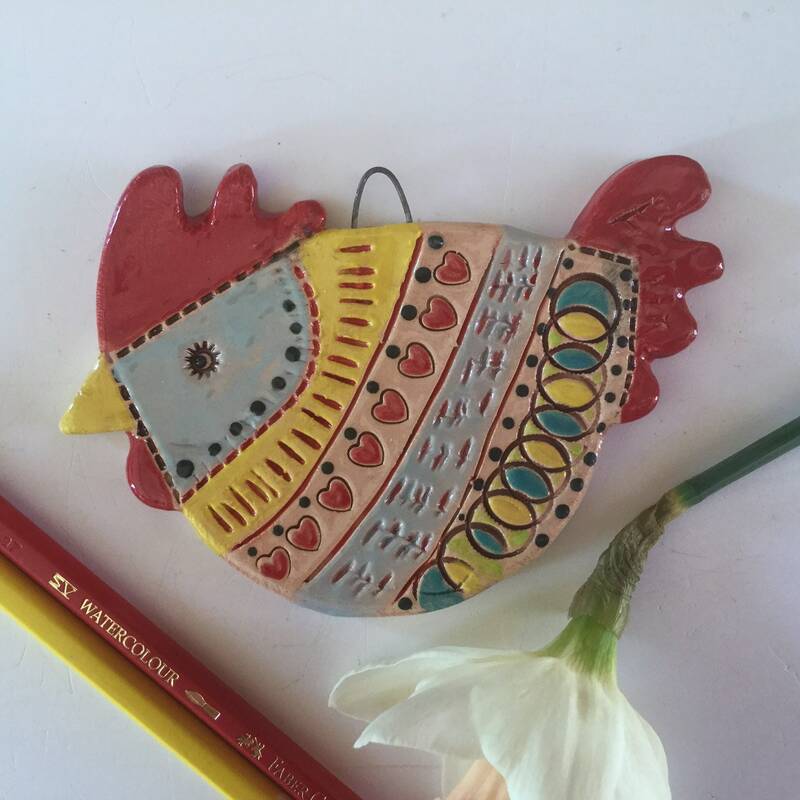 Decorative hanging ceramic hen ornament. Integral wire hanger. Unique bright and cheerful little work of art. 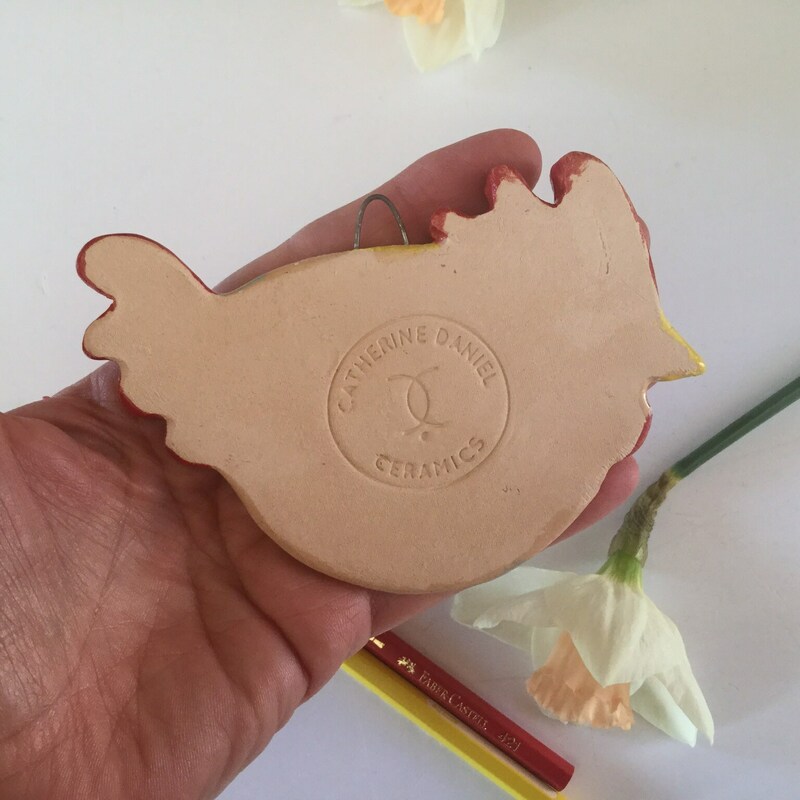 Completely handmade and hand decorated. Measures 14cm at the widest point x 10cm high, excluding hanger. I cut the shape from a slab of earthenware clay and impress the patterns into the wet clay by hand. At this stage I insert the wire hanger. 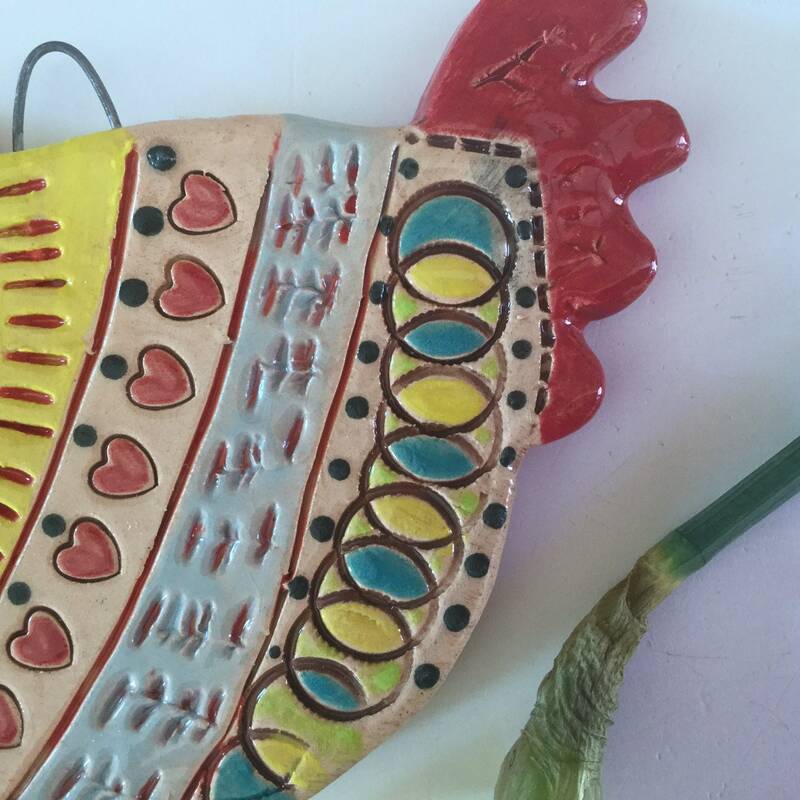 Once dried out, they are bisque fired in my kiln and then I apply the coloured glazes. They then need to be fired a second time. They each have my potter's mark on the back. I accept payment via PayPal and direct credit card. Most major credit cards can be used on PayPal and you do not need to have a PayPal account to do so. I ship overseas to some places. Message me if you need a shipping quote. Any overcharge on shipping costs will be refunded, if it is more than £1.50. Sometimes my items are shipped by Royal Mail and sometimes by courier, depending on what is most appropriate for the individual parcel, and I do try to re-use boxes and packaging to cut down on waste. In-stock items will usually be sent off within 2 days. If they are not in-stock I'll gladly make them to order for you - please see individual shipping times or contact me for further advice. If you order more than one item and part of your order is made to order, I will ship all items together when ready. I currently ship in UK and some smaller items overseas. For a shipment of a larger item outside the UK, please ask me for a shipping quote. Any orders sent outside the UK may be liable for import duties, taxes and handling charges, which you as a buyer, would be liable for. Any overcharge on shipping costs will be refunded to you, if it is over £1.50. 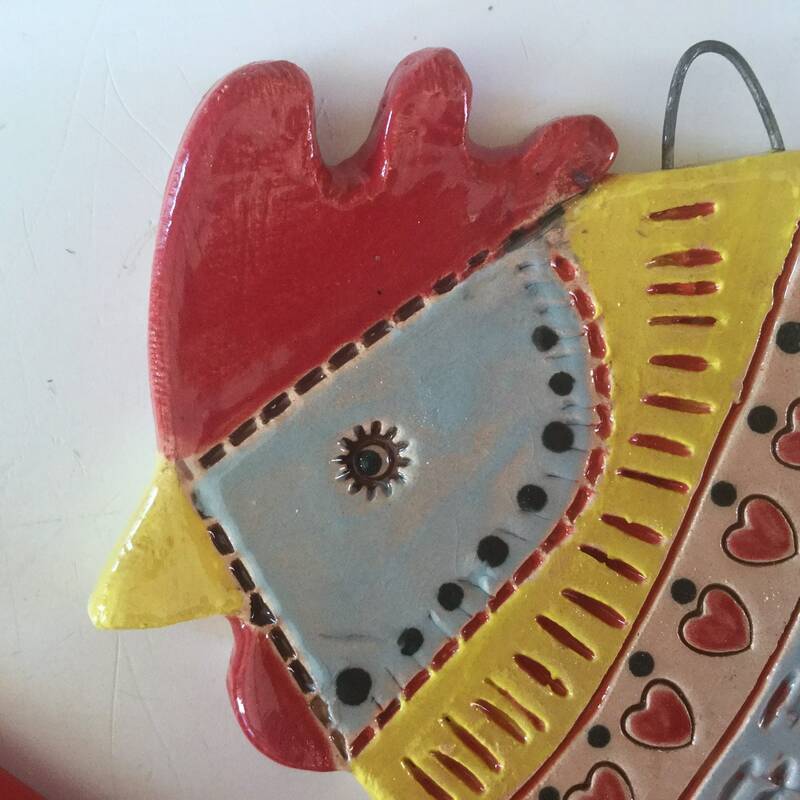 I want you to love your pottery, so if you are unhappy with your purchases for any reason, I will give a refund if required, (minus your shipping fees), once the item has been returned to me, unused and in saleable condition. Return postage will be paid by you. Returns must be made within 7 days of receipt of goods after contact has been made with me. Very rarely, an item may break in transit - obviously a full refund or replacement will be arranged in that case. On receipt of your order, if you have any problems, please contact me. I gift wrap all orders in coloured tissue paper, string, gift tags, ceramic gift tags, etc. Larger orders sometimes include a few freebies (beads, buttons, etc) if I have a surplus.